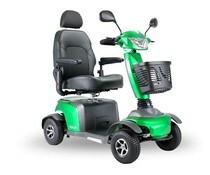 The Excel Galaxy Citiflyer is the entry model within the Excel scooter range. A compact scooter with high driving performance. The Excel Galaxy Citiflyer is the entry model within the Excel scooter range. A compact scooter with high driving performance. The ideal first scooter; affordable, reliable and with a maximum speed of 12 km / h. Convenient in and around the house, but also in supermarkets and shopping centers. The scooter is equipped with LED lighting and LED turn indicators and equipped with 50 Ah batteries. The dashboard of the Excel Galaxy Citiflyer has simple push buttons. Quick to understand and easy to use. The comfortable seat of the Excel Galaxy Citiflyer is fully equipped and can be adjusted as desired. The Excel Galaxy Citiflyer is equipped with a corrective wheel suspension. This provides extra stability and comfort. Available in new, flashy colors.